I truly love them I'm using them on 1970 Alverez Dove. the Ernie Ball strings brought my guitar alive. The Alverez guitar has a nice rich tone in itself and the Ernie Ball 2570 Ex-Lt 10-50 help bring out the resonance response. 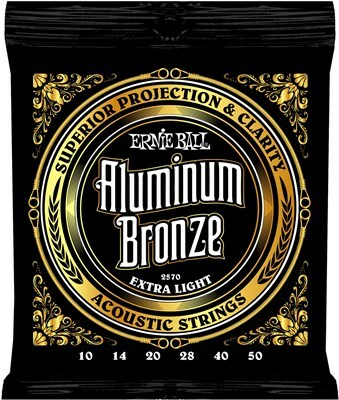 I would recommend them for any acoustic guitar. I'm also enjoying a set of the Jimi Hendrix inspired Pyramid Nickel Classics 10 thru 38 lights I'm using them on a 1980's Jackson Charvel I'm looking forward to recording with them. I've away from my Charvel for a little while it felt really nice to hold her again.Thanks to Strings by Mail for recommending the Pyramid 10 -38's and the Ernie Ball 2570's they both feel great. I'm starting to get my old calluses back. I put a set of these on a smaller bodied acoustic and they work great. They definitely sound clear and crisp with both a pick and your fingers. I haven't played them long enough to know how they hold up but I'm really impressed so far.